Will my children be damaged by my PhD? Thesis Whisperer Jnr was eight months old when I started my Masters degree by research at RMIT and was seven years old when I graduated with my PhD from the University of Melbourne. In retrospect, the decision to go back to post graduate study with a very young child seems slightly insane, but I remember it making perfect sense at the time. Some thesis tasks fit around parenting quite well. I remember reading Foucault in the playground and doing edits of my PhD printouts while waiting to pick Thesis Whisperer Jnr up from primary school. I treated both degrees like an extra job (which they were as I continued to work part time), so I didn’t spend time doing parent helper stuff or making stuff for the mothers day stall. I don’t remember feeling like I was ‘fully present’ for about 3 of those six years of parenting. I often worried I wasn’t being a ‘proper’ mother to Thesis Whisperer Jnr during this time. I rarely got down on the floor to play trains. We had ‘breakfast for dinner’ (toast or cereal) quite often. I’d forget about doing his reader some nights and I’d always forget to fill in the permission forms for school excursions until the day before. I worried about this a lot. Would daycare turn my son into a psychopath like Steve Biddolph seemed to suggest in his ‘Raising Boys’? Or would he just hate all things academic and end up being a school drop out? When the guilt got to be too much I would to take Thesis Whisperer Jnr to campus with me on the weekend, give him some note paper and a pen and let him amuse himself on the floor of my office while I worked. The image above is one of the drawings he made for me in those mother-son weekend campus visits when he was about four years old. He told me this was “Mummy Studying”. Apparently I am in a space suit and giving serious thought to both UFOs and clouds, which, when you think about it, is quite a good depiction of PhD study. Its strange, insightful weirdness captivated me at the time and I keep pinned up on my board at work ever since. I do wish Bailey Bosch’s ‘Mums who study’ blog has been around at the time to make me feel more, well – normal. Recently Bailey has released a delightful picture book called ‘My mum studies’. Since my baby is now 14 (and, I’m happy to report, not a psychopath or someone who hates school), Rebecca Gelding kindly offered to do a review for me. Rebecca Gelding (@rebeccagelding) is a part-time PhD Candidate at the Department of Cognitive Science, Macquarie University, Sydney Australia. She’s researching what is going on in the brain when people are imagining music. You can read about her and her work in a blog she’s just started, here. I really wasn’t sure what to expect. I’d ordered it just based on the title “My mum studies just like me” and front cover (I know, never judge a book by its cover; but what can I say – it had me). Plus it seemed to me like every time I was on Facebook, someone in the PhD & Early Career Researcher Parents Group was saying their copy had arrived and I had serious case of FOMO. The day the book arrived in the post, my kids (6-year-old daughter & 4-year-old son) couldn’t wait for me to read it to them. And though it probably is aimed at slightly older kids, the pictures are so great that even my younger one was drawn in. And so we started to read…. As we began, all I’m thinking is “yep, I can relate to that….. yep I can relate to that…. Yep…” But it wasn’t until we got to the page with the messy house when my daughter exclaimed “we have toast for dinner sometimes too!” that I knew Bailey was on to something, especially as I looked around my own messy house. It seems this page resonates with most mum’s that have read the book – a real tear jerker moment. So what is it that brings us to tears? Perhaps it is that realisation that its ok not to have it all together all the time…… so the kids had toast for dinner, so the house is a shambles – this season will not be forever. In this season, its ok for some things to be less of a focus. Perhaps also it is in the vulnerability that we appreciate. Bosch herself has admitted the whole toast thing sticks in her own mind as a moment she felt like a failure. In academia we often share our successes with one another, but I think it is through vulnerably sharing our failures (or perceived failures) that we can truly inspire others. For me personally though, it was at this point in the book, I felt myself exhale in relief as I realised…..I am not alone. Being a PhD mum is amazing but can be strangely isolating. I’m only part time, so I’m there for school pick up / drop off and lots (not all, but lots) of the other school mums don’t “get” why I’m studying; or why I don’t have university holidays; or why I would do a degree that would take so many years (“haven’t you finished yet?”). I’m sure they think it’s some sort of strange hobby. Meanwhile at university I’m faced with the other side of the coin. Where I arrive for a meeting at 10am and I have already been up since 6am; organised breakfast; prepared lunches for all 4 members of the family; gotten myself ready; gotten two kids dressed; bags packed; hair done; teeth brushed; homework done and packed; hats and sunscreen on; walked up to school, then preschool to drop off, only to have to run to catch a bus. And that’s a standard morning when there are no dramas (“she’s trying to touch me with her porridge”… “he started it”…). While I wouldn’t change it for the world, I feel like the friends and colleagues I have at university (and I’m fortunate to have found some great ones) can’t really identify with my life outside of university. So I’m left feeling like I’m always flipping between two very different worlds. But in reading this book, and in meeting other parents who are doing / have done their PhD (thanks here to the #survivephd15 MOOC for helping me make these connections!) I realise, I am not alone. There are many around the world in the same boat as me (in fact there is even a Facebook group of PhD Mums based in my city). And we can all encourage each other along the way! Now, to be honest, my kids couldn’t understand why the mum was upset about giving toast – my son would have peanut butter toast and a banana for dinner every night if I let him! So I didn’t get teary until the very end of the book, when the mother’s learning inspires her child to do their best (something close to my heart which I’ve written about before in my blog); but this sentimentality was short lived because when we finished the story, I asked my 4-yr-old what his favourite part was he shouted “the sloth!”. As soon as I’d finished they demanded an immediate re-read, which I think is the ultimate honour that can be bestowed any kid’s book! So thanks Bailey for making studying as a mum “normal”. Thanks for reminding us its ok not to have it together all the time; that we can be vulnerable about the tough times; and that our love of learning can rub off on our kids. And personally, thanks for reminding me that I am not alone. This entry was posted in Book Reviews, Getting things done, Your Career. Bookmark the permalink. « What do academic employers want? I can totally understand. I too have a working mom. Many times we have pasta or noodles for dinner. Many times we cannot understand each other but I am proud of her that she has the courage to pursue her dreams. And has the courage to make sacrifices to give us a better life. ​Thank you Inger and Rebecca, I really needed to read this. I’ve just started my third year of my PhD and it looks like I’ll have more than 12 months to go, which I attribute to my inability to do everything I need to do (including being a mum). I feel happier knowing that I’m not alone in in this balancing mess. Lovely read, and a timely reminder that it will all be fine in the end… I am towards the last few months of my PhD now, and have had two kids throughout, along with working part-time. It broke my heart just a little last week (okay – I sobbed all the way to the library!) when I heard my almost three-year-old say ‘It’s Saturday, mummy’s work day’, and realised that for all her living memory, I hadn’t had a whole weekend with all the family together. The end can’t come soon enough! You are certainly not alone. I think this impacts any age, gender, ethnic background and religious views. 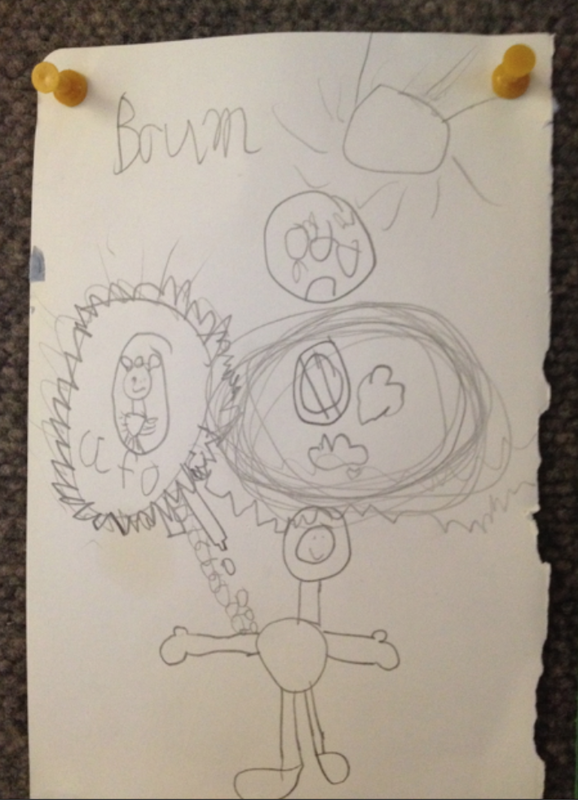 I remember doing my PhD and G asked me – Daddy, does doing a PhD make you happy? This was one of the most challenging questions that has stirred me as I sought to define what happiness meant to her at age 3 back then. As the PhD cohort is now characterised by working adults, multi-taskers, caregivers etc, it is increasingly more an emotive journey than just getting that elusive paper at the end. The PhD journey is a hollowing journey – because of the ebbs and flows, but one that I don’t regret, yet having to make some sacrifices/compromises along the way. I am glad I hold on to my Christian faith at times, because otherwise, one might be already diagnosed with clinical depression ( I suspect) many times over……. This is such an important issue to discuss. How many women are inhibited from dreaming and achieving a higher degree by the gendered social constructs and expectations that create so much work, conflict and guilt. I’m (hopefully) in my last year of getting this PhD done. I started when my children were 11, 13 and 16. Teenagers are much more critical and articulate than toddlers and there were times when their accusations of neglect were excruciating. I’ve had some long periods of struggle and depression and even though there were a few sympathetic friends I had very few colleagues who shared this parenting/PhD journey. This in itself points to exclusionary institutional practice. So I have persevered and overcome, and these days I hear back through the grapevine that my kids speak of me with acknowledgement of my achievement, with pride and respect (at last, hallelujah! ), and as young adults at university and in the final year of school they are incredibly independent and capable and dedicated scholars themselves. Thank you for this post and the links, and to all PhD mothers – you are awesome and it is worth it and your children will know it and benefit in ways you can’t yet imagine. I m a mother of three kids 12 , 10, 10 . I m trying to get admission in PhD in Europe or Australia. PhD with kids is really a hard task. But after reading about your (wrded) story i have got much encouragement. I feel i can do that.I emerged from long period of stressed life with more strength and passion.Women almost everywhere especially in developing countries have to face more responsibilities as compared to men. Thanks Wrded. Mine are currently 11, 13 & 16 and I’m nearing the end of my second year. I’m currently burdened by large amounts of guilt including about the financial pressure I’m putting the family under. Thankfully, I have an awesome husband and brilliant supervisory team including two who did their PhDs with small children. This post is bang on the money. Here’s a male viewpoint – offered with humility and appreciation of the crucial role of family in PhD completion and noting some benefits that accrue. When I completed my PhD about 20 years ago, my wife worked and I mainly stayed at home. She was the mainstay for income and all that entails while I was a househusband and a house builder (literally building as a complete novice, a large two storied house from scratch) as well as being a part-time academic and researcher. True, I had some tax-free scholarships and a fee-free regime to help but without my wife’s sacrifices the research would not have commenced let alone proceeded and the house would not have been conceived, let alone built. Even now, the kids (three of them) speak fondly of that period: the oldest has vowed, though, that he will never ever build a house like his dad did but there’s little doubt that his computing skills were forged at that time when he wrote a valuable thesis assistance program whilst still at high school. That particular program was the one that enabled his dad to blend two different sized databases for analysis. He, like each of the kids, also became a touch typist and believes, like the others, that it was during this period that he learnt to write. He also contributed to two refereed journal articles prior to finishing high school. What lingers for me, however, is something far more abstract. I think that all three of the children became used to seeing hard work going on and they continue that legacy. Hard work is their norm – they’re not lucky, it’s just that the harder they work, the luckier they become! And during the course of their hard work at school, they all learnt to use a range of document and diagram producing software as well as various forms of referencing software. Two of them learnt that before they’d finished primary school and the accompanying understandings of academic integrity seemed to be a stable-mate of developing such skills. The oldest told academic staff informally at an Interview for a course he was trying to get into, that he knew about NUD*IST, the forerunner to NVivo and they were quite staggered at that. (They’d been talking about a difficulty they were experiencing.) But it was true that he did know about that software and he later worked with it as a research assistant whilst he completed his own studies. Toast and around the house sloppiness and mess? Yes, that occurred too. My daughter sometimes went to school with three plaited pigtails because her father simply couldn’t get his fingers to do two plaits neatly. They, the three plaits really were produced at strange rakish angles but at least they were unique! My oldest son lived off ‘Paul’s law’ which states that nothing ever falls off the floor but his ability to file his schoolwork, academic work and now his professional work became, and is now, second to none. The middle, child, also a boy, loved having two dogs (great danes) a bike, and five acres of playground set on a rural and gravelled country side road. Did he run wild? No. He was into sports and sports and more sports as well as running the dogs. He’s still into sport and he still has a dog and now he runs around on our latest six and half acres of ‘playground’ whilst I’m doing a one-year stint back in Australia at another university for a year, this time as an academic developer. But pleasingly, he recently confided to me that he believes that a national award he won was probably due to his writing skills having been honed as a consequence of his old man’s PhD. Some seepage of skills and understandings had made their way into him, by osmosis, over the years. The above reads somewhat idealistically but it’s not all bells and whistles – when the university ‘forgot’ to pay me on-time, or the scholarship funding was delayed, meals and supplies became very meagre and luxuries were almost non-existent. But the children and the dogs didn’t really need to know that their parents were doing it hard. And in the long run, they didn’t appear to suffer and neither did the parents or the dogs! I now strongly advise students to negotiate with their family prior to starting any thesis work and I make a point of discussing benefits and challenges as well as the need to ensure that there are paybacks – doing the dishes, cooking, cleaning and the like! I was extremely lucky and could not have begun, let alone proceeded and finished if my wife had not been the rock of Gibraltar, the super-earth mother for her family. I couldn’t agree more about the legacy that being a studying parent instils in your children. My dad started going to uni when I was 10. Although he hasn’t done a PhD (yet..! ), he slaved away at his undergrad degree as a mature age student and then progressed to do a Masters by research, while working fulltime. Our first big family holiday coincided with a visit to his university (he studied by correspondence) and I will never forget when he proudly introduced us to one of his lecturers. From Year 9, going to Uni Open Day became an annual pilgrimage. Although I laugh about it now, it had a profound effect on me. On reflection, dad role modelled the importance of education and the ability to balance life with life-long learning and has been an ongoing source of support and inspiration for my own study. Oh, thank you for this post! I worried about this all the time, doing my PhD (my boys were 3 and 7 when I started, and 7 and 11 when they came to my graduation). I worked full time during my PhD, and studied part time, and parented all the time, and it was so hard to keep the balances in place. We ate a lot of scrambled eggs on toast, and pancakes, and cheese sarmies, too, when I was just too exhausted to summon the energy to cook on my nights (thank goodness for husband and his chicken stews and amazing soups). I worried that my boys would feel second best to my PhD and job, and that they would resent it. Sometimes they did (‘Mum, why you are *still* working? It’s the weekend’). But mostly, they were okay. And I think seeing me graduate, and seeing me do this big and important thing for myself, meant something to them (or will do when they are older and have a different perspective). I remember fretting to my supervisor, who went through most of the same things doing her PhD, and her saying I was showing my children a powerful example of a working mother – a woman who has her own life and self, but loves them and cares for them, and that our kids need examples of woman who care for themselves as well as their families, so that we stop holding mothers to impossible standards and support working parents in more helpful ways. That has stayed with me. So now, working on a book and seeing the slow return of eggs and toast for dinner, I fret a little less, knowing that my kids know they come first in my heart, but also know that I am me, and that they love me like this. Strength to PhD and academic mums everywhere! I have been following Thesis Whisperer since I started my PhD last August and this is a hugely helpful article. I started my undergrad history degree part-time/long-distance when my son (my youngest of 3) was four and he is now 15. Along the way, I completed the BA and also Honours and now I’ve embarked on a PhD. He does not remember a time when I have not been ‘studying’ and appears to take it all in his stride. He claims that my most frequently used phrase in the past when assignment deadlines drew near was ‘Go away, I’m working’. It was amusing BUT heartbreaking when he first told me that. I don’t think we have ever had breakfast for dinner but takeaway is a favourite option! And yes, I tend not to talk about my PhD to anyone else other than my family and fellow PhDs …. Other school parents and friends are not really interested and you can just see them thinking the ‘why are you doing this?’ question. Thank you for posting this article and I’ll be looking for that book and checking out the other websites! I’m living in Switzerland with my small family and juggling a full-time Phd by distance (God help me) with work and motherhood. I can relate to this wonderful post very strongly, with the added bonus of having no family support at all (except via Skype!). For my eleven-year old daughter, there are no outward signs of what I do apart from the piles of books and papers on my desk and I know she often resents my time away doing something that seems so hidden and so at odds with the rest of our very Swiss and totally German language world. Thank you! What I think is probably you won’t have much time to spend with your children simply because now your excuse is PhD, later it will be work, but as long as you do your best to find time for your children, and if you have a free minute, you spend it on them, everything will work for the better. Later you may regret not going through with it. And living with regrets isn’t that nice. You should do everything that matters, so that later when you are a granny you will be able to tell your grandchildren that you managed to do everything while having family so that they won’t be discouraged by some minor matters. Besides, according to the article by dissertationwriter.org having a PhD degree will provide you with better job choices which also results in providing better life for your children. Although, happiness shouldn’t be connected to your financial sisutation, but unfortunately it isn’t always like that. And lack of cash doesn’t sound so good, does it? That’s why I believe getting PhD is good both for you and your children. Surely, there might be some problems but life isn’t life if you don’t have problems. So, don’t think too much into it. I believe go for PhD has more pros than cons. But still, the decision is yours and I believe whatever you choose will be the best. Just make sure you won’t regret your choice. After a few lines of the text, I concluded that you are a single mum, being the only one taking care of kids, solely responsible for food on the table, etc. Then I see that 4 family members are mentioned – two kids and, I assume, their father. Then I read a comment where a husband is praised for cooking for the family – sometimes. This is all so sad. Children are not only the mother’s responsibility. Cooking is not a woman’s job. Men are equally responsible for their families as women, yet there’s no “My dad studies” book to help the kids get over the fact that dad is immersed into something outside of childcare. Because dad is allowed that without further explanation. Theses writing isn’t the issue here, it’s patriarchy.